As an active member of TheSocialGolfer.com, I spend the majority of my weekends playing golf and as qualified Physiotherapist, I spend a lot of time discussing fellow members golfing injuries – and occasionally treating at whichever club we are at! As such, I thought it might be good to get some information out to everyone, as I’m sure picking up any golfing injury is very frustrating. Not only does it prevent you from enjoying your golf but at worst, stops you playing …. however, don’t despair that personal best score could be just around the corner! It may surprise you that the most common golfing injuries I see in clinic is not in fact Golfers Elbow (Medial Epicondylitis) but Tennis Elbow (Lateral Epicondylitis). This is followed closely by Shoulder and Back pain, which is more expected. This is followed closely by Shoulder and Back pain, which is more expected. Golfing Injuries – What are Golfer’s and Tennis Elbow? As the medical Latin name suggests, the pain is situated around the Epicondyle, which is the knobbly bony bit (very technical) that you can feel on both the outside and inside your elbow and where, if you suffer from it, the pain will be situated. In between this and the main point of your elbow is where the tendons sit. Tendons are like pulleys and levers and are the main load baring structure in any joint. So, as you can imagine, the amount of strain that goes through it during a golf swing will cause irritation. As you get older, these tendons begin to wear and become more irritated, so the more you play, the more it can become inflamed. Golfing Injuries – What can you do if you get this type of pain? There are a number of methods out there that are discussed and bandied around. However, after seeing probably around 5,000 of these things, I feel well placed to suggest my method is most effective! You can try ultrasound, acupuncture and strengthening exercises, all of which have some use, however they need to be used in conjunction with Manual Therapy. As one TSG member Colin Samuels, would testify, this is agony, but clears the pain in the session. Under normal circumstances, I would expect four sessions to be effective, as part of a full management strategy. I would work into the tissues and areas that are affected (the sore part) and then give you a tailored management plan to ensure you are pain-free. Golfing Injuries – Will you need an injection or surgery? In all my years of being qualified, I have NEVER had to send a single patient for an elbow injection for any form of golfing injury (yet!). I feel very strongly that these should always be last resort and am confident that our approach to treatment can avoid this. Although I do perform injections myself, I always try to avoid it where possible, as the side effects and outcomes are not always great. Golfing Injuries – Where can I go to get treatment? I work for a company called Physioworld, which has clinics all over the UK. BigWigz is a new golf accessory in club care, allowing you to restore some your old clubs back to their former glory and a chance to personalise your clubs and stand out from the crowd. What is a BigWigz …. BigWigz was launched in the UK in June 2014 and has already established itself in the US, Japanese and Korea markets. The BigWigz is essentially a special golf club skin, that lets you personalise your driver head through a non-permanent self adhesive 3M vinyl with a special adhesive backing to prevent air bubbles. It completely covers the top surface of the driver protecting the club from those annoying knocks and scratches, whilst giving the club a new “paint” like finish. The product conforms to both the USGA and R&A rules and can be fitted by you. Every pack has the simple tools and information needed to apply in minutes. All packs even include a practice skin for you to trial fit before re-styling your driver. Upon first opening the pack you are met with a number of ‘bits’ that to start with look completely foreign to anything else you’ve ever used on a club before. However once you have read the checklist, it is soon obvious what they all do …. The pack comes with an instruction leaflet, although this is incredibly small and difficult to read, however a quick Google search will soon direct you to a video that explains how to fit the BigWigz much clearer. But be careful to prepare properly as this can be a precise process and one that does require a steady hand. That said, once you realise the skin itself is very pliable, you will soon find that getting a smooth finish is pretty easy. The key thing is getting the ‘cutting’ tape in the correct position thus ensuring a crease free finish. We managed to complete the process first time round in under 10 minutes, but we would recommend that you practice with the spare skin first. Actually, pretty good. The skin has a very clean finish and whilst there is a little fraying on the back it a good finish. I’m am sure this would be avoidable with practice. Overall, we are very pleased with how the restoration looks. The cost is £19.99 per pack and provides all the tools required with the exception of the hair dryer. You can even upload your own photos to their website and have your designs made for your clubs. We think the BigWigz is a great idea. No one likes looking at a tried old golf club as they stand on the tee and this is an affordable and unique way to get those clubs looking good again. It’s relatively easy to fit, there are plenty of designs in the range to satisfy all persuasions. In short, we like it! Find out more information go to www.bigwigzskins.co.uk and give your clubs a makeover now! TheSocialGolfer.com (TSG), the online social networking community for golfers celebrates its fourth year in existence, by launching its first ‘Above the line’ marketing campaign. The website run by ex-Media Director Ian Mullins will be running a series of 10 second commercials throughout July and August using the world’s biggest Sports Radio station – talkSPORT. The commercials written and produced by Mullins’ own marketing consultancy MC2 Marketing, launches on the station the same day as The OPEN commences. TheSocialGolfer.com airtime will run for approximately seven weeks and plays on the theme of ‘being let down by your mates’. The campaign has been planned to target an ABC1 35+ male audience and will reach over 3/4 million individuals with each listener hearing the campaign approximately 6 times. Talking about the campaign Mullins said “It was always our intention to eventually launch the TSG brand to the masses but we have deliberately waited until such time as the website was a busy and much used resource before tempting a wider audience to try our service. In 2013 the site hosted over 700 golf events and had more than 4,500 rounds played. However, we recently hit the 8k+ users and feel now is the time to grow the community further”. Mullins has worked across a number of blue chip brands in his career including managing the Emirates Airlines media activity for 7 years, Hitachi for 7 years and launched the Daily Star Sunday for the infamous Richard Desmond in his 11 years at the UK’s largest Media Independent MediaCom. More recently he was responsible for managing The London Golf Show marketing activity including the launch of the Manchester Golf Show in 2013. He was also responsible for launch of the ‘Altonwood Season Ticket’ for the late Ron Noades’ Altonwood Group in the same year. He has also advised William Hunt of Trilby Tour fame on sponsorship matters. Join Barry Hearn and Matchroom Sport at the prestigious Abridge and Country Club on 25th Sept and help raise money for Saint Francis Hospice based in Havering-atte-Bower, Essex. Enjoy a fantastic day out with the stars, enjoy 18 holes of golf on this beautiful course, designed by Henry Cotton, set in the heart of Essex countryside. What the Barry Hearn Golf Day includes…. 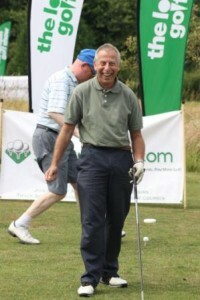 The Day is hosted by Barry Hearn himself and last year the generous golfers who attended raised £24k for patient care. We are hoping that this year – our 30th anniversary year – we will raise even more! We look after our golfers by offering complimentary refreshments at the half way house. We have businesses book up and use the day as a corporate day with clients, so this is also a great networking opportunity too. Barry Hearn brings along friends & Corporate associates from the sporting industry to this golf day from boxers to football players. Previous days have included Steve Davis, Trevor Brooking and many more. ‘’This golf day offer an irresistible combination of a great day of entertainment while raising money for a cause vital to the community. Join me and my friends on the greens, and help to keep this very local cause open for business. All funds raised goes towards patient care at Saint Francis Hospice” – Barry Hearn. The Social Golfer (TSG) – the online social networking community for golfers – held its annual TSG OPEN Golf Day Championship at Bletchingley Golf Club in Surrey on 5th July 2014. The day was attended by over 60+ able-bodied and disabled golfers from all over the South East of England and from as far away as Portugal and Lithuania in aid of BALASA Golf – The Charity Promoting Disabilities For ALL Golfers! Now in its fourth year, the now much coveted Halliwell Cup (donated by Stroke Victim Ian Halliwell) was won by Weybridge & Surrey based TSG member David Holmes, with the Ladies Trophy retained by Horley & Surrey based golfer Virginija Zlabiene. £5 of each player entry fee was donated to BALASA resulting in over £1k raised for the charity, which will go toward providing buggies for disabled golfers at their UK and international events. There were also more donations to the cause from the likes of Muswell Hill (London), Warley Park GC (Essex), and Royal Blackheath GC & Westerham GC (Kent), Pine Ridge GC & Woldingham GC (Surrey) – all ‘TSG Preferred Courses’ as well as raffle prizes donated by TheSocialGolfer.com itself. The day’s event continued into the early evening with a dinner and raffle and we are very grateful to Alan Haywood and Stephen Slater for their help on the day. Of course we must also thank Anna Guss and Clare Mistry for their wonderful donation of a day with them at Wentworth, this alone raised £200.